Uttar Pradesh government is going to provide pension facility to farmers of UP soon. The Government is going to give more than 14.21 lakh destitute people the benefits of Kisan pension yojana. 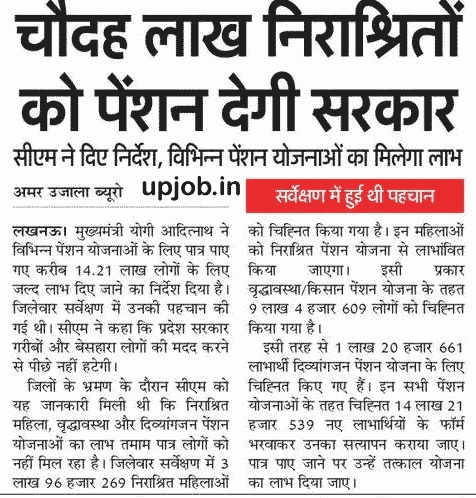 Uttar Pradesh's departmental officers have been instructed to provide the benefits of pension immediately to the eligible candidates. Chief Minister Yogi Adityanath has instructed the beneficiaries of various pension schemes to get benefits for about 14.21 people soon. Candidates were identified in the survey, which were eligible for pension. The Chief Minister said that the state government would not be left behind to help the poor and destitute people. During inspection of various districts, the information was received by the CM that the beneficiaries of old age pension schemes (Vridhavastha Pension Yojana), Vidhwa Pension Yojana (widow Pension) are not getting the benefit. In district wise survey, 396269 destitute women have been identified. These women will be benefited in the Nirashrit pension scheme. Similarly, 9 04609 people have been identified under the Old age Pension Scheme. Similarly, 120661 beneficiaries have been marked for Divyang Pension scheme (Physically Handicapped). The forms of such candidates are being filled up and verified. If eligible, they will also get the benefit of immediate plan. List of Nirashrit / Vidhwa / Kisan pension scheme has been uploaded on the NIC website of all the districts, from which you can see your name in that list. In the Kisan Pension Scheme, candidates have been selected for village wise. The list of selection is available on the official website of all districts. You can view your name by downloading the PDF file. The pension list of eligible farmers will also be made available on the following link. Do not forget to subscribe to this website so that we can immediately send you all the important information related to the Kisan Pension Scheme.